If “food and wine” are your middle and last names then you need to clear your calendar for the American Academy of Chefs dinner Saturday, June 23rd at 6 pm at the historic Maryland Club, 1 East Eager Street, Baltimore. The theme is East meets West: Asian/Pacific rim meets Mid-Atlantic cuisine. The honor society of American Culinary Federation (ACF), the American Academy of Chefs (AAC), represents the highest standards of professionalism in the organization, society and industry. The Academy’s primary mission is to promote the education of all culinarians by mentoring culinarians, awarding scholarships to students seeking a future in the culinary industry, and by providing grants to professional working chefs looking to further their career. The Greater Baltimore Chapter (GBC) of the ACF is hosting this AAC dinner at the Maryland Club. 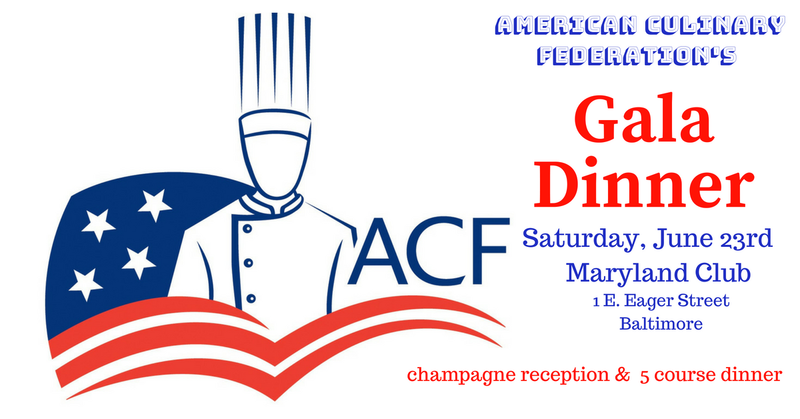 Proceeds for the dinner will support the AAC scholarship fund at Anne Arundel Community College (AACC) as well as donate to the ACF National Culinary Olympic Team. When purchasing, please advise if you would like to be seated with certain guests. You will receive an email confirmation once payment has been received. Due to recent renovations, parking is limited at the Maryland Club. There are several parking lots within a 2-block radius of the club. Use www.spothero.com app to find parking lots with reduced rate and reserve space or let UBER or LYFT do the driving.